Welcome to the Making Memes Mini-Challenge of Bloggiesta Spring 2015! If this is the first you’re hearing of Bloggiesta, learn about this fun event for spiffing up your blog at the Sign Up post. If you’re here to participate in the Making Memes Mini-Challenge, let’s get started! I wrote a Making Memes post last spring for Armchair BEA about how I started the two memes at Joy’s Book Blog, Readers’ Workouts and British Isles Friday. Today is less about my experience and more about how you can do it, too! The word “meme” has several uses on the internet. The meme we’re exploring today is a regular event on a blog where a host blog invites bloggers to link up posts with related content. These events are also called “link-ups” or “link parties.” Most frequently, link parties are held every week on the same day, but they can also be monthly or every other week. 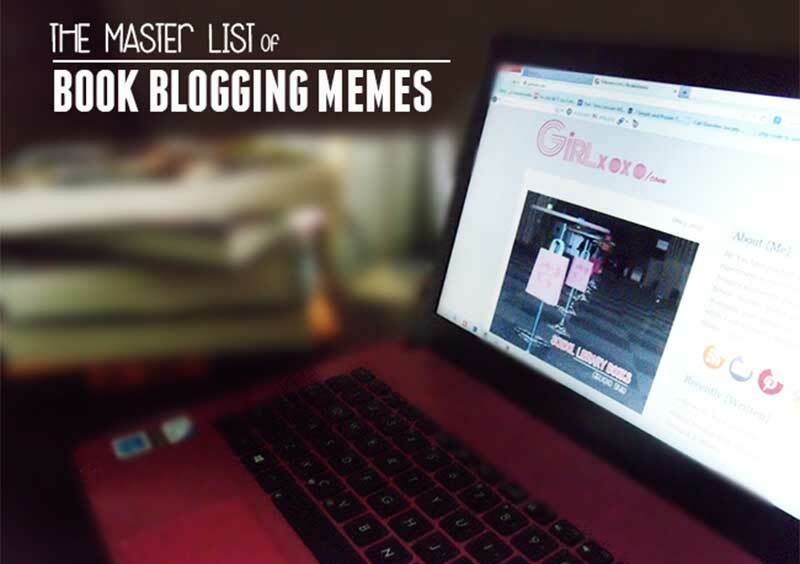 Tanya at GirlXOXO has been maintaining a Master List of Book Blogging Memes — check them out! Participating in memes is a great way to generate content for your blog and to make connections with other bloggers. Hosting a meme has the same advantages on a larger scale — just like the difference between going to a party and planning one yourself. The most compelling reason to start a meme is because you want to share and encourage a particular type of content. Make sure that you’re really excited about it because you’ll need to generate posts week after week. When you’re participating in memes, it’s no big deal to skip a week or more. When you’re hosting, people count on you to be there so skipping a week isn’t an option. Even for vacations you’ll want to pre-schedule posts or get a participant to be a guest host for that week. The most common question I get when people are considering starting a meme is “What if I throw a link party and no one shows up?” My advice is to start a meme that is so important or so fun for you that you don’t mind if there are weeks when you’re partying by yourself. It’s rare for Readers’ Workouts or British Isles Friday to have zero participants, but it happens occasionally. Even one participant makes me happy because that’s enough for a conversation. Just when I think the meme is dying for lack of interest, I’ll get six participants some week. There’s no rhyme or reason to when a meme gets low or high participation, so don’t drive yourself crazy about it. Your theme. Check Tanya’s Master List of Book Blogging Memes to make sure your idea isn’t already being done and as inspiration for new ideas. Some memes require advance planning. Life of a Blogger, for example, sets up a prompt each week ahead of time so bloggers know what topic to write about. 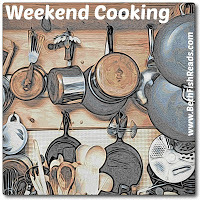 Other memes are organized around a theme that doesn’t change from week to week, like Wondrous Words Wednesday or Weekend Cooking. Your day. Again, the Master List will be helpful. If you know that many of your blog readers participate in Mailbox Monday and Friday Finds, you’ll probably want to choose a different day of the week for your meme. Your location. Some memes, like Booking Through Thursday, have a separate website, keeping things neat and tidy. Most memes, though, are at the host’s blog. Memes can drive traffic, so if you care about that, put the meme on the site where you want the most readers. Your tool. Some memes collect links in the comments, but most use a tool to gather all the links into a list. I use Mister Linky. I got started with it during the spring 2012 Bloggiesta with this mini challenge. The free version was fine for the beginning. With the free version, you get to have only one list open at a time — so last week’s link party had to be closed before the new one could be opened. For $5 a year, I was able to get a Silver membership that allows for unlimited link lists to be open at the same time. That was helpful when I wanted to pre-schedule posts during a vacation and it also made it possible to host two different link parties in one week. Another popular tool for book bloggers is InLinkz. 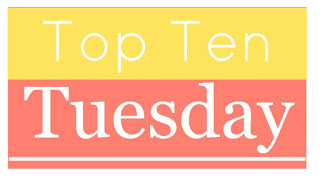 See last week’s Top Ten Tuesday for an example of how that looks. The user interface on InLinkz appears to be prettier and easier than Mister Linky and there’s a free version to get you started. Upgrades, though, cost a bit more at InLinkz. Your logo. As you can see from the examples used to decorate this post, logos can be simple or complicated. Some memes don’t have logos, but most do. Your participants will appreciate having a graphic to add to their posts and they make your meme easy to advertise on social media. Many meme logos are 200 x 200 pixels, but you can make yours a little larger in one dimension or another for something a little different. Before the First Party. You can just throw open the doors and see who shows up, but you’ll get more participants the first week if you give people some warning. I got British Isles Friday off to a good start with a post soliciting input about the idea during last spring’s Bloggiesta. Several bloggers helped me shape the idea and, then, graciously showed up for my first week. Reminders. Each Tuesday and Friday, I tweet a link to this week’s Readers’ Workouts or British Isles Friday post on Twitter with the @handle of people who have participated in these memes in the past. Other memes set up an email newsletter that goes out when the meme is up and running — I would imagine this would be particularly effective for those memes that run less frequently than once a week. Comment on all posts. Comments encourage bloggers to participate in your meme again. Not commenting on the participating posts is as impolite as a host ignoring a party guest. This rule can be waived if your participant list gets too numerous, of course. By then, you’ve probably built a community where participants are commenting on each other’s posts, so you can keep the energy high by commenting on a few posts each week, making sure that you’re getting around to most of the blogs every month or two. Follow-up. Some meme hosts post all the participant links on a site like Pinterest or Google Plus. By tagging participants on those sites, they will get a notice, reminding them that they might want to think about a post for the next week’s gathering. Toe Dipper. Act as if you’re going to start a meme and choose your theme, day, and location. Write a post about your idea or share it in the comments to solicit input from the Bloggiesta community. Cautious Optimist. Take your idea a step farther by choosing a link list tool and designing your logo. Share in a post or the comments so we can admire your preparation. Super Star. Given that this Bloggiesta is a week long, there may be a few people who get their memes up and running. Congratulations! Let us know in the comments so we can all join in your link party. Let me know what you’re thinking, where things are going wrong, and how I, or the Bloggiesta community, can help you set up your meme. We can talk in the comments or shoot me an email (all three of my names at yahoo.com) or tweet (@joyweesemoll). Thanks Joy for this comprehensive list. I think I’ll have a dabble around in it. Just researching the accumulated list and jotting ideas down so far! I am thinking of resuscitating a meme that was around since 2007 and died last summer bc the host had personal issues and basically stopped blogging. I’ve tried getting in touch w her to ask, but I get no response, although I know she’s out there. It has nothing to do w books. It was called Vintage Thingies Thursday. I’m making it a goal to get a response this week. What a timely post!! I’m starting my own meme next month 🙂 I hadn’t originally conceived of what I’m going to do as meme, but I think it would be fun to invite others to join in if they’re interested. Thanks for the tips. I use InLinkz (free version) for the 2 memes/readalongs that I host each year (AusReading Month in Nov and the Wharton Review in May). It has been fine for both of these. It allows me to tweek dates and set up options as the month progresses. Great post – very useful Joy. I already use inLinkz for linking so that is what I would use. Great post! I’m not Bloggiesta-ing this time around, but hope to do a lot of visiting. I’m not ready to host a meme, but these are great tips for if I ever do! Yes! I’m hoping people will leave links to their meme ideas this week so we can all offer input on them. Thanks! Great tips for starting a meme! I don’t think I’ll be starting one soon, too many responsibilities right now…but I love memes! Wonderful post–clipping it to Pocket so I can come back and read it tonight (when I am not working). 🙂 It is on my radar to work on a Meme (for my own interest, perhaps others want to join me too) so the master list is fabulous to have. This is a great post; I’m bookmarking it so I can find it again. I participate in several memes myself (Sunday Post and Top Ten Tuesday on a fairly regular basis, Tough Travels on an occasional basis, and once in a while Waiting on Wednesday) and I’ve sometimes thought about starting one, so this is invaluable advice. And I plan to check out your British Isles Friday meme, as I am a huge Anglophile! I have decided to go ahead and start the meme for month in review starting at the end of March. Thanks for the push and information Joy. Appreciated. Woohoo! I’m looking forward to it. That’s coming up fast! I’ll have to get a post started. It will be easier next month when I can think about it all month. Thank you for this mini-challenge. After all week, I finally came up with an idea for a meme that I’m actually excited about. I’m not going to go into a lot of details because I’m still at Toe Dipper stage, but it will involve a fun way to promote multicultural children’s books. There’s someone who I think would make a wonderful co-sponsor, so I’m going to get in touch with her soon. Enjoy the rest of Bloggiesta! I hope it works out! Having a partner would ease some of the burden. Excellent advice, so thank you for putting this together! I had an idea for a meme, but looks like it’s already been done so need to put my thinking cap back on. Looking forward to the new month in review meme that Kathryn is going to host!